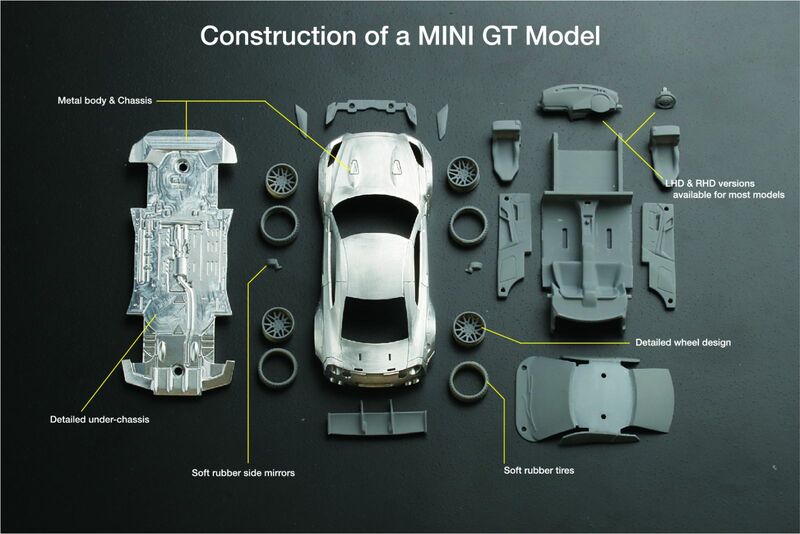 MINI GT marks the start of a new adventure for TSM-Models. As we begin our journey into 1:64 scale modeling, our goal is to deliver the same balance of quality and price that can be found in each of our models. We also aim to provide a more hands-on experience for all collectors as we model a wide range of cars in this smaller scale, creating a marvel of engineering that will fit into the palm of your hand. Welcome to the wonderful world of 1:64 scale! Each model is produced in full diecast metal to deliver quality construction you can feel in the palm of your hand. We strive for strong level of detail - even the under-chassis is fully reproduced. No flat surfaces here. Each model features soft rubber tires with detailed wheel designs to complete the look. The side mirrors on the majority of our models will be crafted from rubber for maximum protection. To fully represent each model we will offer both LHD and RHD versions of the majority of models we create.